Reach for the stars. Be all you can be. Unlock your potential. Noah’s greatest aspiration…probably not building an ark against all reason to survive a deadly flood. Job. Job was successful. He did great things. And He was a Godly man. Then God let Satan mess up His life and take away His earthly possessions, loved ones, and health. But that’s the Old Testament. In the New Testament we meet Peter. Expert fishermen. Based on His devotion to Jesus and his faith, we can be pretty sure Peter was seeking to live a good, godly life. He ended up persecuted, jailed, and using his fishing talents on people who largely didn’t want what he was offering. Paul was kind of a big deal. He even wrote up a whole list of why he had every reason to brag and was all set up for major success in life- as a God-fearing man. Then He met Jesus. All appearances of success and Paul reaching his earthly potential went out the window. God even gave him a thorn in the side, keeping Him weak. 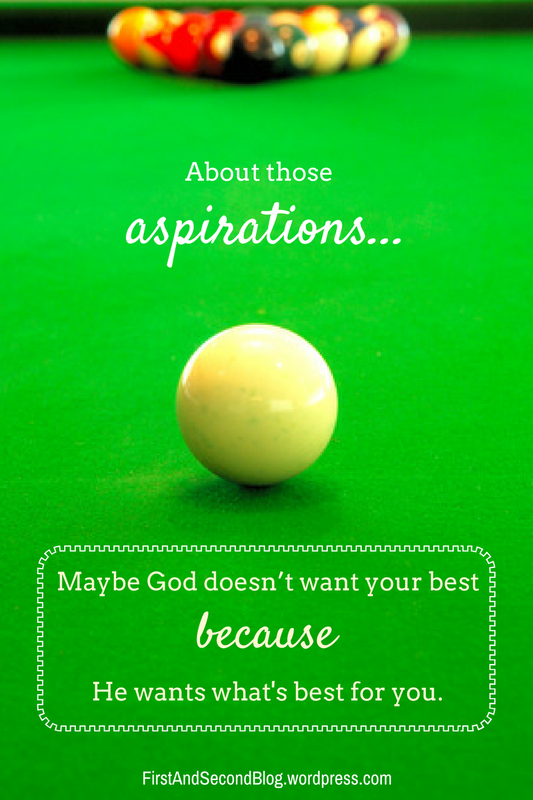 Maybe God doesn’t want your best because He wants His best for you. The Lord we serve can use anyone and any circumstance for good. He can be glorified by teachers, celebrities, CEOs, and housewives. He can also be glorified by failures, criminals, the bed-ridden, and the crippled. Your ability to earn top dollar and desire to use the money for good doesn’t make being CEO God’s goal for you. Your inability to read well doesn’t mean God’s plans for you don’t involve using words to share His Word. So often we try to reason through God’s plans for us instead of submitting to and following His. We miss out when be doubt what He prepares for us to do is even better than what we are prepared to do. What that means for you and I is this: focus less on what you believe you can be successful in and more on who He’s made you to be. So grateful you were encouraged Cheryl!! Love seeing the Lord work! Oh yes! Our God often has a plan for us that does not involve us “using our talents.” He wants to be our strength, our source and our song! Bethany- great food for thought! God can use us even in areas where we feel the weakest! Yes He can, Julie! Such a blessing! Thank you! Great thoughts! Our best is not much compared to His best. Thanks for sharing it on #LMMLinkup!